EDI - Electronic Data Interchange from Coast to Coast Fulfillment, Inc.
Electronic Data Interchange (E.D.I.) Fulfillment with Coast to Coast Fulfillment, Inc.
What does Coast to Coast Fulfillment, Inc. do with respect to EDI? Coast to Coast Fulfillment specializes in the warehousing and physical processing of EDI orders on behalf of its clients. From the purchase order through the final shipment and processing of returns, Coast to Coast Fulfillment handles all aspects of order fulfillment via EDI from A-to-Z. Most major retail chain stores require suppliers to communicate with EDI protocols for both bulk wholesale shipments and drop-shipped orders sent to consumers. Coast to Coast Fulfillment has over 20 years of EDI experience as a 3PL (third-party-logistics) company, warehousing merchandise and processing orders, handling all the picking, packaging, labeling, scheduling, and shipping details according to the exacting EDI specifications of retail chain stores. Who does Coast to Coast Fulfillment work with? Coast to Coast Fulfillment works with its manufacturer-clients, EDI service bureaus, and EDI value added networks (VANs), to seamlessly handle all aspects of EDI order-processing from retail stores. EDI (Electronic Data Interchange) is a standardized global electronic communication system for transmitting and receiving data between trading partners according to mutually-agreed-upon Message Implementation Guidelines (MIG). EDI information is transmitted computer-to-computer, with data received, processed, and acknowledged by computers without human intervention. Documents transmitted via EDI include purchase orders, order acknowledgements, Advance Shipping Notices (ASNs), bills of lading, receiving advice and invoices. Because information pertaining to orders in processed 24/7 without human action, transactional information is instantaneous, without manual data-entry errors. EDI has been proven to be the fastest, most-secure mechanism for exchanging transactional data between organizations throughout the globe. Though EDI is a standardized system, the data within specific documents can have different sets of information from each trading partner. Furthermore, data mapping and data translation are often required to make external EDI data compatible with internal inventory and order processing systems and software, while many different incompatible versions of EDI software are used by various trading partners. Coast to Coast maintains versions of all relevant EDI software, while working closely with EDI service providers to insure that all information from every trading partner and client is accurate, secure, and can be acted upon by our warehouse personnel. 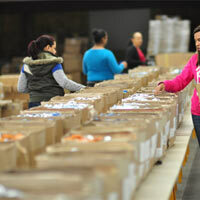 How does Coast to Coast Fulfillment physically handle the orders? While EDI orders are almost exclusively wholesale orders, how and where they are shipped can vary greatly by the trading partner. Each order requires close supervision by the fulfillment house to ensure complete compliance. 1) Distro (distribution); typically, we would receive 6 purchase orders consisting of 1 order for each distribution center, then we pick, pack and ship the specified products in 6 shipments, consisting of 1 shipment to each of the 6 distribution centers. 2) Pre-Distro (pre-distribution); typically we would receive 1,000 purchase orders, one for each retail store, then we would pick and pack products to match the requirements of each retail store's order sorted into 1,000 separate packages, representing 1 package for each store. Then we would group the packages by the stores' respective distributions centers and ship 1,000 packages on pallets divided among the 6 distribution centers. 3) Drop-Ship to Store; we would receive 1,000 EDI purchase orders, as with Pre-Distro, except each individual stores' package of products is "dropped" in a shipment directly to the store instead of going to a distribution center first. This insures faster just-in-time (JIT) delivery and can be economical for small, light-weight items. 4) Drop-Ship to Consumer; we could receive thousands of purchase orders for orders to be shipped directly to customers of the retail stores. Thus, our client would bill the retail store for the wholesale price on each purchase order, but the orders would be shipped directly to the consumers (B2C). Coast to Coast Fulfillment specializes in EDI order processing, warehousing and handling all 4 types of EDI orders from mass-market retailers on behalf of its clients. How can my company get started with EDI? Even if your company isn't using Electronic Data Interchange, many of your competitors and trading partners probably are. To get started with A-to-Z hassle-free third-party handling of all your products under EDI protocols, contact Coast to Coast Fulfillment now. Speed: Transactions that once took several days can now be completed in an instant with EDI. Accuracy: Accurate data ensures an efficient supply chain. Cost Savings: Reductions in per-order costs are common with the implementation of EDI.